Short Review: Carefully structured and professionally presented, JiuJitsu.net offers an innovative approach to structuring an online instructional site. The curriculum is also carefully considered, a guided route which could be especially useful for less experienced grapplers. At $25 a month, pricing is the same as juggernauts like MGinAction: it will be interesting to see if JiuJitsu.net can survive in an increasingly crowded marketplace dominated by big name instructors. Things have changed a great deal since then. Lukehart has earned his black belt from Ralph Gracie stand-out Beneil Dariush and runs Brea Jiu Jitsu. He's considerably less keen on Gracie University too, a shift in perspective I can understand (I go into lots of depth on the program in my extensive review). Originally Gracie University was supposed to be for people with no access to BJJ, but it has swiftly morphed into a successful means of expanding the Gracie Academy brand, often stepping on the toes of established academies. Lukehart also has a reputation for creating clear and concise instructional videos. That ties in with my second main memory of Lukehart, which was seeing his excellent series of YouTube videos breaking down and sharing Roger Gracie's game (seeing as that's my own lineage, I was especially interested). He took on Caleb's role as the articulate voice of the BudoVideos commentary team, while continuing to build his school. More recently, Lukehart has stepped into the increasingly crowded online instructional market. To do so, Lukehart bought the JiuJitsu.net domain, a sensible move for SEO, but presumably not cheap. Previously it featured the services of 'Jiu Joe Jitsu', who looks to have sold self defence DVDs, before selling the URL some time in 2014/2015. At first I had thought it was Gene Simco's infamous old site, Jiu-Jitsu.net, but that has a hyphen (although that url might be available too, as it appears to be down at the moment). JiuJitsu.net's biggest challenge is probably the competition from numerous big names already on the market. MGinAction is the biggest, with an enormous library and the immense clout of Marcelo Garcia (a legendary competitor, who now appears to be building up his own team of impressively capable students). Among the many other examples, the Mendes Brothers are another huge name, then there's also my personal favourite BJJ Library, headed up by the Ribeiro brothers. Coming from a different angle, you could also turn to the aformentioned Gracie University, successful despite the controversy over online grading and instructor certification. Legitimate online jiu jitsu instruction (as opposed to the online equivalent of comic book ads promising to stop those bullies kicking sand in your eye) has been available for about a decade now, pioneered by people like Jean Jacques Machado and Jason Scully. It reached a new level of sophistication with MGinAction, but personally I found that site overwhelming when I tried it on a trial a couple of years ago. JiuJitsu.net takes some of the good ideas from MGinAction, like the ability to flip videos, without adopting the confusing long sequences of technique. It also looks like the videos Lukehart made available during the period I had access to the site (November 2015) were filmed specifically for the website, rather than class footage. That means that Lukehart always wore a blue gi, while his partner was in a white gi. With class footage, the instructor is grabbing somebody from the class to demonstrate, who may be wearing the same colour gi. 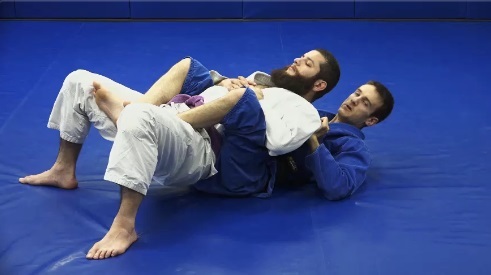 With a simple technique that isn't a major problem, but it can become a significant hindrance in something like a complex open guard, where limbs and gi grips twist all over the place. The layout is interesting, using a method I've not seen on any other instructional sites. In terms of accessing videos, you click through a 'pie' of positions, with each slice expanding into ever increasing levels of specificity. While that's cool, I would have also liked the option to browse through an orthodox list of all available videos (there is a list on the right, but limited to the section you're viewing). That also means I can't judge how many videos the site actually has, though it does at least appear to have a few videos for each of the basic positions (i.e., mount, side control, back, closed guard, half guard, open guard). You can also switch around the sections on a central dashboard, a simple but nifty touch. The pie chart is accompanied by a 'mind map', where you can go into more detail. It would appear there are various nodes on the mind map that do not lead to a video yet, but presumably will in future. I was testing the site during back month at my school: unfortunately I couldn't find a video on turtle defence, which either indicates it isn't available yet, or it's suitably buried that I can't find it. Searching 'Turtle' brings up 'Turtle Concepts', which handily sets the mind map to the right point when you click it. From there, you can keep clicking 'back' to get where you want. The 'Progress' in that list on the right had eight videos when Turtle Concepts was selected, while 'Specialize' had another eight, all under a similar title based around a position or area. Each time you select a video in 'Progess', you get different options in 'Specialize', but right now the list doesn't vary all that much due to the small number of videos. It was very cool how you could link through to examples of the technique done by other people, such as competition footage from Roger Gracie at Metamoris. However, I did wonder if that was going to run into copyright issues, unless JiuJitsu.net has some kind of long-term arrangement with whoever owns that footage. 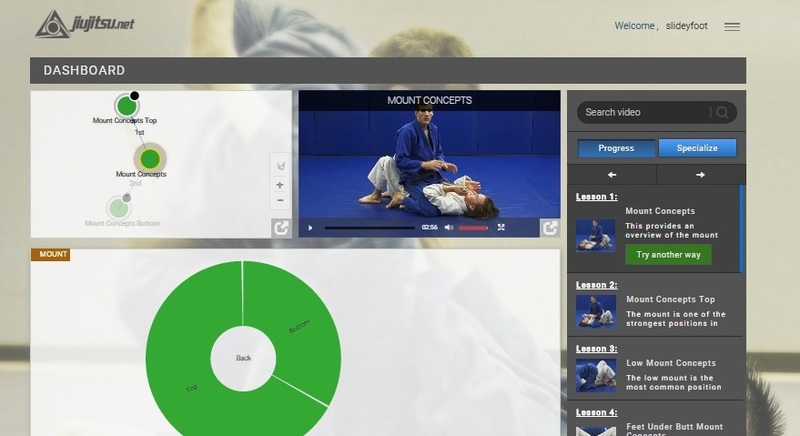 Sites like BJJ Library and MGinAction have lots of material as the featured instructors have vast competitive records and lots of personal footage. If JiuJitsu.net is going to rely on third party material, that might become problematic, unless that is fair use. I don't fully understand the legal side of it. Back defence starts with a general video on five different sub-types. I was intrigued that Lukehart advocates having his back to the mat as the ideal position. I always look to either get them to one side, or sit up: it's useful to get a different perspective. Lukehart gradually takes you through what he defines as the multiple subpositions of back control, expanding further into related techniques. That also connects through to other positions, such as half guard, enabling you to see the bigger picture. It's a shame you don't appear to be able to add videos to a playlist, as they tend to be very short. Most of the ones I watched were around 2 minutes. I felt that there were a number of videos that could easily have been combined, but on the other hand, I much prefer too much splitting out than too much combination (as mentioned earlier, a flaw I feel mars MGinAction). 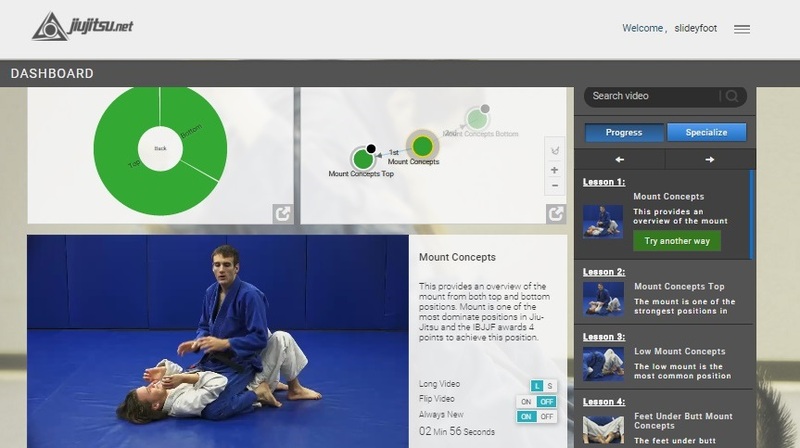 JiuJitsu.net isn't offering online rank, fortunately, just structured learning. Interestingly, that structure is adaptable. It is difficult to judge how successful that is at this early stage, but it is a promising concept. I especially liked the 'Try Another Way' feature, appearing in green on the selected video. I'm not sure how well it works across the whole of the site, but testing it with the knee slice, when you click Try Another Way, you get three different options from the same starting position (knee slice to thumb in grip, knee slice to smash pass, knee slice to x pass). Having long and short formats for each video is another great idea, something I've often wanted with instructionals: a long version to get the details, then short for a refresher. However, quite often nothing comes up on the short version, or when it does, it isn't all that different (e.g., on Knee Slice Concepts, you've got the choice of either around 3 minutes or 2 minutes). I'd prefer something like a 30 second short version, but again, it is early days. You can also flip sides, like with MGinAction. I also very much liked the marketing: there isn't any attempt to use those horrible '90s templates, sneaky efforts to get your credit card information or pushy advertising copy. I'm not certain yet if JiuJitsu.net will be able to compete with the big beasts presently roaming the online instructional landscapes, but hopefully there is room for innovators like Lukehart to stake out a place for their approach. Out of curiosity, do you have a preference for any specific BJJ online training site? Yep, I do: BJJ Library, which I reviewed here.